e=0·0001223 of a Par. inch. 5·2833 Par. lines; and consequently it must have been considerably less luminous than that of Nobert. 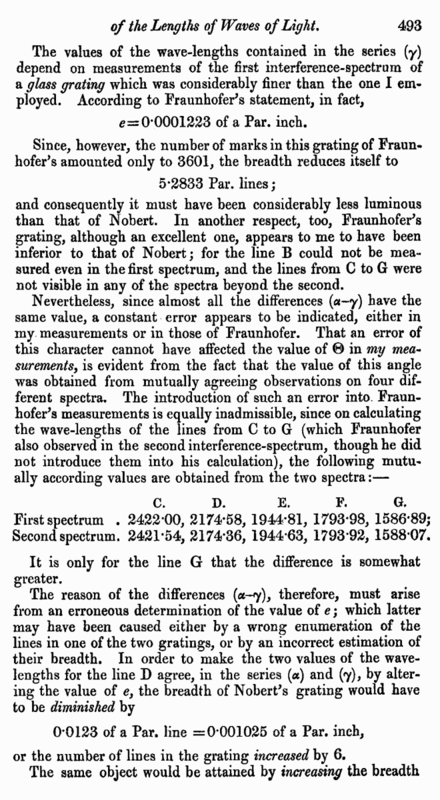 In another respect, too, Fraunhofer’s grating, although an excellent one, appears to me to have been inferior to that of Nobert; for the line B could not be measured even in the first spectrum, and the lines from C to G were not visible in any of the spectra beyond the second. It is only for the line G that the difference is somewhat greater. or the number of lines in the grating increased by 6.
or by diminishing the number of lines by 5. 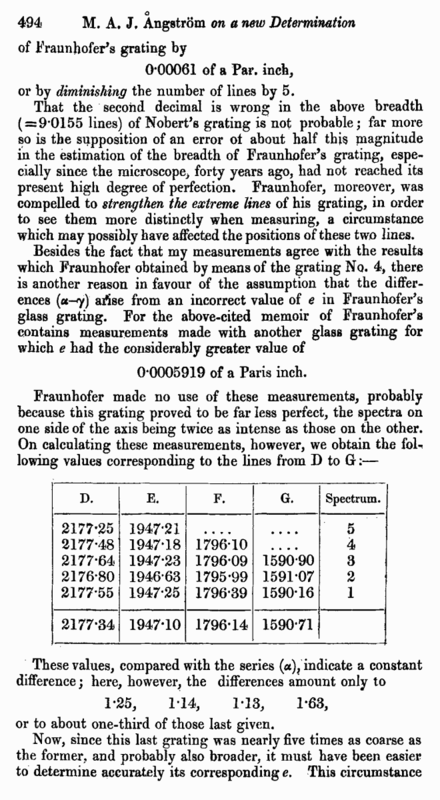 That the second decimal is wrong in the above breadth (= 9·0155 lines) of Nobert’s grating is not probable; far more so is the supposition of an error of about half this magnitude in the estimation of the breadth of Fraunhofer’s grating, especially since the microscope, forty years ago, had not reached its present high degree of perfection. Fraunhofer, moreover, was compelled to strengthen the extreme lines of his grating, in order to see them more distinctly when measuring, a circumstance which may possibly have affected the positions of these two lines. 0·0005919 of a Paris inch. or to about one-third of those last given.